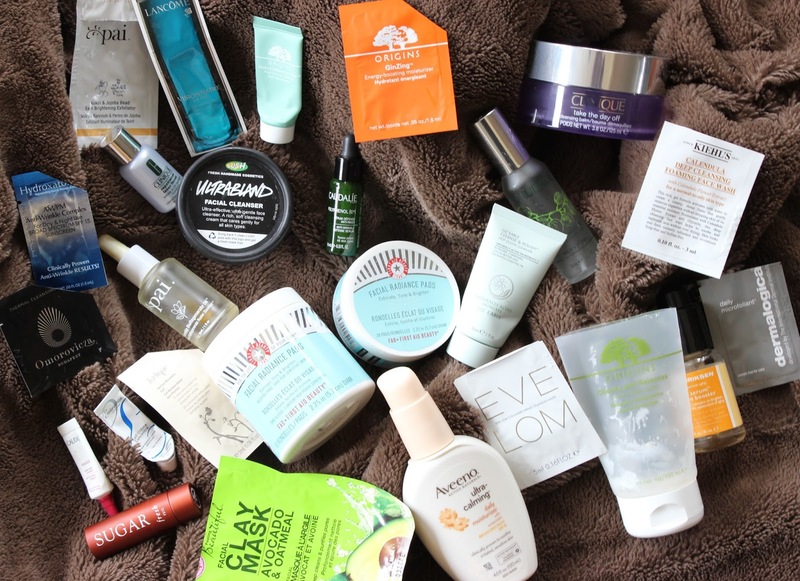 The final installation of my 4 Part Empties is here and it is all about skincare! There are quite a few things to get through here, so I think the easiest way will be to go by order in which I use them. Let’s dive in! I feel like I have nailed down the majority of my morning skincare routine at this point. This means that you will probably see a few items here that I have talked about before. I will so my best not to go on about those. Cleanse: I start each morning by cleansing my face. In the colder months, I prefer a balm cleanser, like Lush Ultrabland Facial Cleanser or Clinique Take the Day Off Cleansing Balm. Ultrabland is lovely, but does leave an oily residue on any washcloth or muslin cloth you use to take it off. The Clinique balm is my top pick here because it has no scent, doesn’t leave any oily residue, and washes off clean from your skin. The few samples I got through here were the Liz Earle Cleanse & Polish Hot Cloth Cleanser, Omorovicza Thermal Cleansing Balm, and the Eve Lom Cleanser. I’ve used Cleanse & Polish a few times, and although it is nice, I’m not sure that I’d ever purchase the full size of this. I had been dying to try the Omorovicza one for ages after hearing countless YouTubers talk about it, but when I tried it, I was very underwhelmed. First off, the smell…awful! I just couldn’t get past that. To be fair, the sample size it far too small to make a call on the actual product – but the smell was definitely a deal breaker for me. The Eve Lom Cleanser, I didn’t like at all. It was gritty and oily. For something so pricey, I had expected a more luxurious feeling formula. Tone: After I cleanse my face in the morning, I go in with a toning step. I prefer a refreshing spritz in the morning to wake myself up as opposed to using an exfoliating toner (I do this in the evening.). My favorite is Caudalie Beauty Elixir. It smells lovely and natural, feels cooling and is oh so refreshing! I buy the small 1 oz bottles. They tend to last me a few months, and I spray VERY liberally every day. Serum: I do have 2 favorites in this category, but I love trying serums. This is a step that I haven’t nailed down quite yet. The 2 favorites are Ole Henriksen Truth Serum Collagen Booster and Clinique Repairwear Laser Focus Wrinkle & UV Damage Corrector. The Ole Henriksen serum is refreshing and smells of oranges. It is a gel formula that sinks into the skin very quickly and works great under moisturizer and makeup. I feel like this one keeps my skin looking bright and youthful without being too “technical”. The Clinique one is great! When it comes to repairing skin, I think this one does a great job. I don’t have too many aging issues with my skin yet, but I did have some hyper-pigmentation after years of acne. I used this sample size and noticed a difference in my skin very quickly. Although I have repurchased the Ole Henriksen one a few times, I feel like I will purchase the full size of the Clinique one as I notice more signs of aging. I did have a few samples to get through here too. The Caudalie Polyphenol [C15] Anti-Wrinkle Defense Serum, Lancome Visionnaire Advanced Skin Corrector, and Jurlique Herbal Recovery Gel. The only one of these 3 that I felt did anything for my skin was the Lancome one. That one smelled lovely and had a pearlesence that gave my skin that lovely blurred effect. I didn’t have enough of the product to get a really good idea of how it would change my skin though. The other 2 didn’t do much that was noticeable to me, and if I’m going to spend big bucks on a serum, I want to see results…Am I right?! Moisturize: My final morning skincare step, aside from some lip balm, is to moisturize. I like my daytime moisturizer to have SPF in, but because I work from home I can get by with one that doesn’t have it most days. The one I have liked the best over the last year has been the Aveeno Active Naturals Ultra-Calming Daily Moisturizer with Sunscreen SPF 15. It is specifically for sensitive skin and I don’t find it to irritate my skin at all. It is just a bog standard moisturizer with SPF in. I also like that I can get it from my local grocery store or drugstore. I did also try the Origins Make A Difference Plus+ Rejuvenating Treatment, Embryolisse Lait-Creme Concentre, Caudalie Vinosource Moisturizing Sorbet, Hydroxatone AM/PM Anti-Wrinkle Complex with SPF 15, and Origins GinZing Energy-Boosting Moisturizer. The Origins ones are cooling gel formulas that would be nice for the Summer months, but you will need to be sure to put on an SPF with them. I have wanted to try the Embryolisse moisturizer since I’ve heard so much about it, but I always imagined it to be super thick and way too heavy for my skin type. I was wrong on all accounts! It wasn’t too thick or greasy and it had a lovely subtle scent. The only thing this one was lacking was SPF. I’d definitely repurchase this one for the colder months. Although I did love the smell of the Origins moisturizers, I just didn’t feel like they gave me enough moisture. Again, I think most of my nighttime routine is set, so most of these products should not surprise any of you that read often. Cleanse: My favorite nighttime cleanser is the Origins Checks and Balances Frothy Face Wash. I use this in the shower. You only need a tiny amount because, as the name suggests, it froths up a ton! My skin always feels super clean without that nasty tight itchy feeling. I have repurchased this many times over and will continue to do so (even more quickly now that I’ve found the DH using it)! I did try the Kiehl’s Calendula Deep Cleansing Foaming Face Wash to see how it stacked up, but it was too drying for my skin which is generally the case with foaming cleansers. I do really like Kiehl’s products, but this one wasn’t for me. Tone/Exfoliate: I love the idea of acid toners, but I have super sensitive skin after my Accutane treatment over a year and a half ago now. I heard Caroline Hirons talk about the First Aid Beauty Facial Radiance Pads, and like everything else she talks about, I instantly had to try them! This are perfect. They keep my skin chemically exfoliated, but in the most gentle way. I use one, pre-soaked, pad every night after I get out of the shower – on clean skin. They never irritate my skin. I do notice my skin doesn’t have as nice of a texture when I go a few days without using them, so I know they are working. You can see I’ve repurchased these and am working on my third jar! I don’t generally like manual exfoliants because they are too abrasive for my skin. I did try 2 samples though that claimed to be less harsh, but just as effective. The Pai Kukui & Jojoba Bead Skin Brightening Exfoliator and the Dermalogica Daily Microfoliant (this is a powder that you mix with water, but I mixed with my regular cleanser). I LOVE Pai Skincare, but it wasn’t enough to make me love the exfoliator…sorry Pai 🙁 I still LOVE you though! I also didn’t love the Dermalogica one. I think because it had Salicylic Acid in and my skin doesn’t get along with that…I guess I still don’t like manual exfoliators. Serum: My end all be all nighttime serum is the Pai Rosehip BioRegenerate Oil. I LOVE this stuff! I have repurchased it countless times and never go without. The only other dry facial oil to rival this one is the Kiehl’s Midnight Recovery Concentrate, but I just can’t bring myself to not have the Pai one in my regular routine. Ideally, I’d use both every night! Extras: Every night I put on a thick layer of lip balm as the last step in my skincare routine. My absolute favorite is the Fresh Sugar Lip Treatment with SPF 15. Because it is so pricey, I only tend to use this when I have gotten it as a gift. This one I got for Christmas and it lasted me 6 months! I am a huge fan of Fresh products. Finally, I have one mask. I like to use a mask every 2 to 3 weeks, and mainly on targeted areas (read – where I have spots popping up) unless it is a sheet mask. The one I used recently was the Freeman Facial Clay Mask with Avocado & Oatmeal. I got quite a few uses out of this little sachet because I don’t use it all over my face. It was a very nice creamy clay mask that didn’t overly dry out my skin. With avocado and oatmeal, I felt like it was nourishing as well as deep cleaning. I have heard loads of lovely things about the huge line of Facial Masks from Freeman, and I plan to try out a few more at prices like these! With this, my 4 Part Empties comes to a close. If you stuck with me through all 4 of them, you get a gold star!!! Thanks so much for stopping by! Stayed tuned for my next post which will be an updated What’s in my Bag. I may or may not (definitely did) have gotten a new bag! What are your skincare all stars??? I’d love to know what you repurchase on a regular basis!